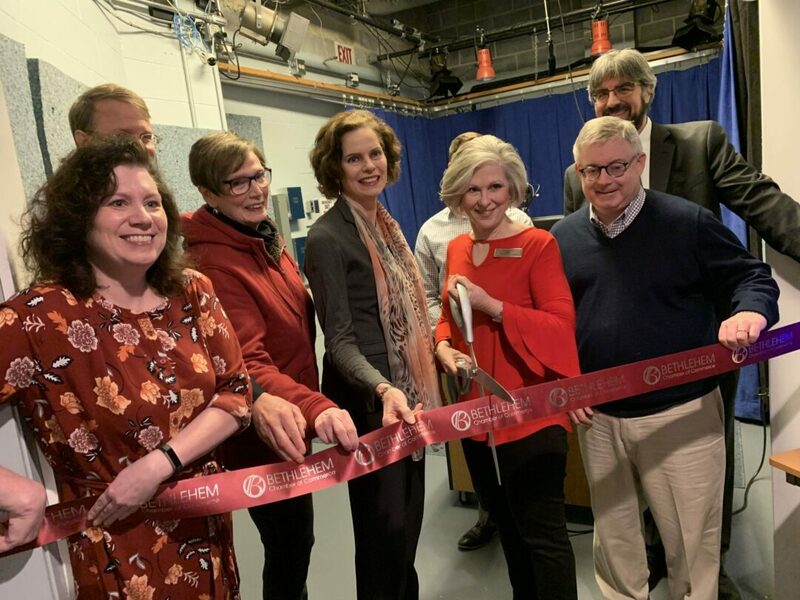 BETHLEHEM — The public library held its ribbon-cutting ceremony for its new self-service Studio Makerspace on Friday, March 22 at 11 a.m. to officially open it to residents who can use to film videos, record podcasts, convert audio and video files, and more. “We’re very excited, we’ve been talking about this for a very long time and it’s nice to bring it to fruition,” said library director Geoffrey Kirkpatrick. He added that in the past week or so, the library has received an anticipatory response from the public and had even given a few exclusive tours to some residents prior to the ceremony. This ADA-compliant studio space is now open all week and can be reserved through the library’s online calendar for three-hour increments by an individual or a group at one time with an Upper Hudson Library card. It includes a One Button desktop — comprising of a built-in video camera, a silver button to start and end recording, and a USB port where an inserted flash drive would save the recorded raw footage — which is accompanied by a talk show-esque backdrop with two seats, a middle table and blue background curtains. Once the user presses the aforementioned silver button, they are given an eight-second countdown during which they can quickly head over to the seats, just in time as the video camera commences recording. In addition, the studio has a podcasting studio to record personal or professional podcasts, a VHS-to-DVD conversion machine, and 10 laptops equipped with video editing software Adobe Premiere Elements. A user can also borrow a video camera for two weeks in case they would like to film or record beyond the library grounds. The ceremony was attended by numerous local politicians and public figures, including Bethlehem Town Supervisor David VanLuven, Town Board members Joyce Becker and Jim Foster, the town’s Chamber of Commerce’s president Maureen McGuinness, and state Assemblywoman Patricia Fahy. She brought up how it can relate to how digital literacy is highly encouraged nowadays as we live in a more tech-fueled world. “So thank you to everyone here and in the town who are continuing to make this town as great as it is with all the opportunities at our fingertips,” she said. VanLuven said that he personally distinguishes the Bethlehem library as the best within the local region. McGuinness said the space is so user-friendly to the point that “you don’t need a degree to produce videos” and residents can use the file conversion feature to convert their old VHS family tapes in order to keep holding onto their memories for years to come. For more information, visit www.bethlehempubliclibrary.org/studio-makerspace.